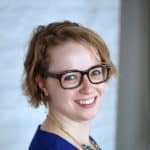 Home » What Are the Best Blue Light Blockers for Me? The author’s personal pair of Uvex Skyper Blue Light Blocking Computer Glasses block the bright blue light emitted from her laptop screen. You’ve probably heard by now that you shouldn’t be looking at screens too close to bedtime. Not only can they be unnecessarily stimulating before bed, keeping your brain awake long after your body should be sleeping, but the blue light your computers, phones, and tablets emit also affects your melatonin production, and therefore the quality of your sleep. And if the quality of your sleep is poor, then you’re at a higher risk for obesity, heart disease, and various chronic conditions. Experts recommend shutting off devices, as well as dimming any bright blue-white lights, at least an hour before you plan to get into bed…but that’s not always possible. Maybe you needed to send a few last emails before bed. Maybe you wanted to be sure to send your friend the perfect happy birthday gif before you forgot. 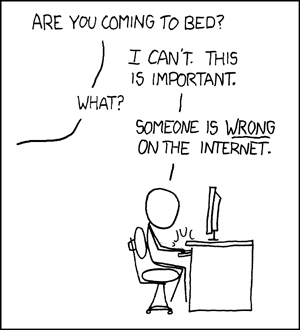 (Or maybe you did forget and you now have to find the perfect “I’m sorry” gif.) Maybe someone is just wrong on the internet. We’re pretty attached to our screens, and all the good advice and self-awareness in the world probably isn’t going to change that very much. But we can control the damage. Special blue light-blocking glasses do exactly what it sounds like: they keep the blue light that negatively affects our sleep from hitting our retinas while allowing us to continue using our devices, with reduced (if not fully eliminated) side effects. 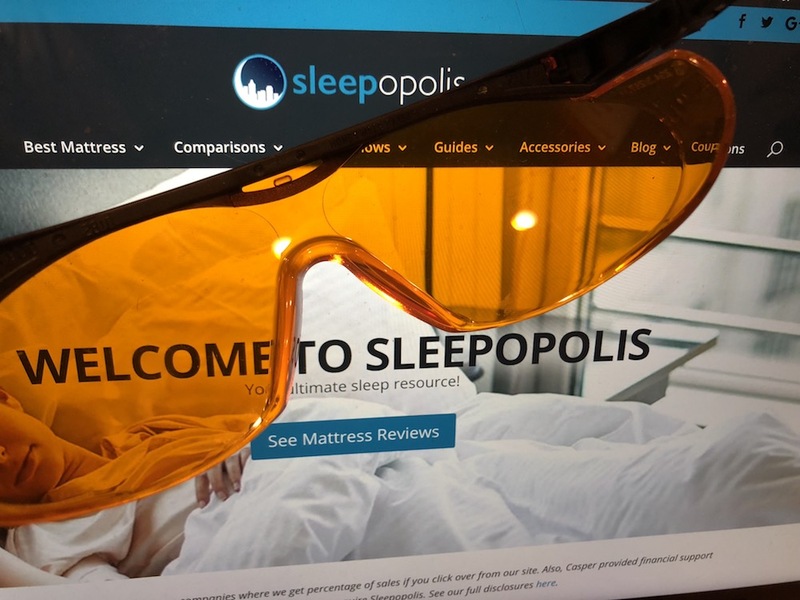 Some of these glasses use yellow- or amber-colored lenses to filter out the blue light, while others use special coating to block the UV rays that make blue light so harmful to our sleep cycle in the first place. Neither is necessarily better than the other, although if you’re particularly near- or far-sighted and you want a prescription pair, the best blue light blockers for iPhone or Android use (really the best blue light blockers for computer screens, whatever the size) will almost always feature the clear, UV-blocking coating rather than the orange tint. But maybe you’re one of the admirable few who has managed to get better about putting your phone down and picking up a book at night, there’s a good chance that you’re reading by blue lights anyway, so there’s no harm in using some special specs with your book, too. 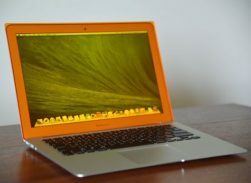 There isn’t any need to get a separate pair for analog versus digital reading: the best blue light blockers for reading will be the same ones you use for your screens. As a matter of fact, you can wear your blue light-blocking glasses for almost any nighttime activity, with one major caveat: if you wear yellow- or amber-colored blue light blockers, do not wear them for nighttime driving. Despite many claims to the contrary, wearing this type of glasses at night may actually do more harm than good, according to experts. 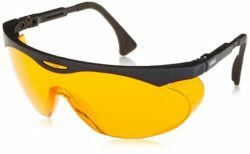 Though yellow and amber lenses may help with hazy or foggy conditions, if you’re looking for something you can wear behind the wheel after dark, the best blue light blockers for driving—and in fact the only blue light blockers you should ever consider wearing if you’re driving at night—are the clear, UV-protectant coated ones. The cost of these glasses can range widely, depending on what features you’re looking for in both your lenses and the frames that hold them. Prescription lenses will always be more expensive than non-prescription, wire frames generally more expensive than plastic, etc. So now that you know how blue light-blocking glasses work and how you should use them, which are the best blue light blockers for you? It depends on what you’re looking for. When you don’t have a lot of money but need something that fits over your eyeglasses, try these Uvex Skyper Blue Light Blocking Computer Glasses. These are actually the glasses my therapist recommended to me as the best blue light blockers to fit over glasses. I have to admit: they look totally silly when I’m wearing them over my everyday frames…but they definitely do the trick when it comes to preventing the blue light from getting into my eyes. So much so, in fact, that I’ve had to put a few apps into “colorblind” mode in order to continue using them at night. When you want something that blends in without standing out, the Cyxus Blue Light Filter Computer Glasses promise to block blue light without letting everyone know you’re seeing orange. Cyxus’s frames come in many different colors and styles, but I chose this particular pair because it looks the most like my regular glasses, so if I wear these over contact lenses no one will be the wiser. When you’re looking to kill two birds with one stone, the Spektrum Prospek Premium Computer Glasses look and act just like a pair of reading glasses. Though you can get the glasses magnification-less if you like the look of them, the true benefit to this pair is that they help with the eye strain caused by blue light and the eye strain caused by too-small text, up to +3.00 magnification. When you want the blue light blockers the gamers love, the Gunnar Optiks Intercept Computer Gaming Glasses frequently top lists amongst console game-lovers. If your game is gaming, your glasses might be Gunnars. When you want blue light blockers that can do it all, EyeBuy Direct’s proprietary Eyezen lenses can be made to accommodate almost any prescription and fit in several dozen frame options. Not only do these lenses block a lot of the blue light our devices emit, but they also feature added magnification toward the bottom of the lens (think of them as bifocals for people who don’t especially need bifocals) to help boost your vision when you’re looking at small screens. Hate the idea of wearing glasses to block blue light? You can still make changes that will make at least a little difference. Putting amber-colored bulbs, like the Sleep Ready light bulb, in your fixtures can help make sure that the blue light around you is at least reduced, and you can block the blue light being emitted from your screens through apps or screen protectors, filters, and covers. But whatever works best for your lifestyle, make sure you’re doing something to limit your bedtime blue light. Your sleep cycle (and your long-term health) will be better for it.